Instructables and Singer have teamed up to bring you the Sew Warm Contest and it’s super easy to enter! Just make a new instructable showing how to make something that will warm you up and submit it before March 6, 2010. There is no limitation on the materials you use or the function of the item, the only requirement is that it be sewn, either by hand or by machine. The fantastic prizes include a Singer Futura SES-2000 All-In-One Sew, Embroider and Serge Machine for the grand prize winner, Singer dress forms for three first prize winners, and Singer sewing baskets for five third prize winners. Click here for the official rules. Good luck and let us know if you enter! Gloria, one of our fave readers, wrote in with a question that inspired today’s post. When I buy one of your patterns, I am directed to a page for instant download. How do you do that? Is there a website that sets that up for you? I have some patterns that I would like to sell but I don’t know how to set that up. Would you please tell me how this is done? We thought some of you might also be interested in learning how to sell your creative works as downloadables online so here is a quick and easy breakdown of the steps. If you have a pattern design, instruction booklet, project tutorial or ebook that you’d like to sell online, the first step is turn your product into a downloadable format that can be easily accessed by your potential customers. Adobe’s Portable Document Format (PDF) is the current industry standard and can be easily read by most every computer and the required reader is a free download. If you don’t already own Adobe Acrobat, which will allow you to create PDF documents, you can use a free PDF converter like Primo PDF or Cute PDF. You can even create PDFs of full size pattern pieces by tiling the images in Acrobat if you have them available in a digital format on your computer. The next step is to determine what method to use for delivering your downloadables. If your customers must wait for you to email them download instructions they may become irritated at having to wait, and you’re actually creating more work for yourself (and customer support issues) than necessary. Online customers these days demand immediate satisfaction, especially if they’re purchasing downloadable products, so make it easier on them (and on you!) by automating the process. We’ve used many different methods of automating the download process over the years, and in fact use more than one method right now, but by far the easiest and cheapest that we’ve found for small businesses is PayLoadz. After testing lots of different techniques, we’ve been with PayLoadz for years and highly recommend them because you can get started for free (premium accounts start at $5/month), their fees are based on your sales so your bill doesn’t go up unless your sales do, and they handle the whole download process on the back end for you. Once you’ve setup an account all you have to do is upload your product file, type in the description and price, and put up the links on your website or send them out via email. You can sell your downloadable products on eBay, Yahoo! and Amazon too, plus they’ll let you choose whether to allow affiliates to help market your products and it’s as simple as clicking a button. When a customer purchases your downloadable product PayLoadz immediately sends them an email with a personalized link and download instructions, plus any additional information that you specify. All you have to do is check your email for sale notifications! PayLoadz can be used with PayPal, Google Checkout, 2Checkout and other payment systems, and has support for six currencies so you can even make international sales. The best part is that PayLoadz protects your files and limits downloads through encrypted links to reduce abuse and unapproved file sharing. This is a great way to get started selling your downloadable products very inexpensively and with limited need for technical knowledge on your part. Good luck and please let us know how PayLoadz works out for you! Awhile back I did a post entitled “Types Of Collars”, with those types being flat, standing and rolled. I said I’d do a tutorial on how to construct and attach each of those collar types, then got sidetracked onto other topics. Today, and for the next several weeks, I will pass along the tutorials for you. After cutting out the pattern pieces and interfacing as indicated in the pattern package, you will first apply the interfacing to the wrong side of each under collar. With the right sides together, match, pin and baste each upper collar to each under collar, leaving the neck edges open (A). Stitch each unit along the outer seam line (B), again leaving the neck edges open. Use short stitches at the corners for reinforcement. Stitch across the corners to “blunt” them (as shown in the SEAMS section). Trim and grade the seam allowances (C), trim across the corners and clip the curved seam allowances, being careful not to clip through the seam line. 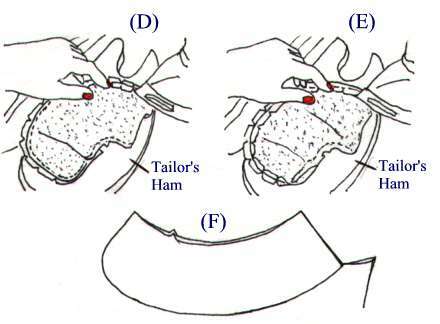 Press all of the seams open over a tailor’s ham (D). Next press the seam allowances toward the under collar (E). The last step in preparing the collar for sewing is to turn the collar units right side out. An easy way to pull out the corners is to thread a needle with a short length of thread, and make a large “knot” at the end. Push the needle through from the inside of the corner to the outside as indicated above; pull the needle through and the knot will pull the corner through where it needs to be. You can then just reach inside the collar the pull the knot back far enough to cut it off and pull the rest of the threaded needle on out. Next week we’ll cover how to attach and sew the flat collar. These “how to” tutorials are an excerpt from our book “Basic Clothing Construction”. This book is a handy addition to have in your sewing room, so you can refer to the various sewing tips and tutorials at any time. 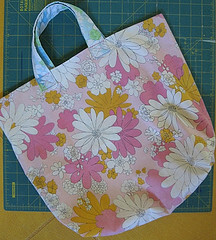 Creative Kismet has a great tutorial on how to make a grocery tote from a pillowcase. I think the design is super cute and I can’t wait to have my four year old girls “help” me make a few. The directions call for a thrifted pillowcase, thread, and about an hour of good music – sounds like a plan to me!